A couple weeks ago, I got an email from a potential customer about whether we could do a special custom order bean bag chair. Since we have great seamstresses, we have been able to custom make lots of unique bean bags in the past 15 years. So, I was excited to listen to her explain what she was looking for. Well, she has a client that needed bean bag chairs that look like tennis balls. That's cool! She said it was for the kids' playroom in a gym. She needed it to be something the kids would really love, and she needed it to be black. I suggested our "Cuddle Soft" one, which is super soft and a little furry like a tennis ball. She agreed to the Cuddle Soft style. I was curious why she chose black, as a tennis ball is normally that yellowish-greenish-chartreuse-y color. It fits the color scheme of the gym she told me. 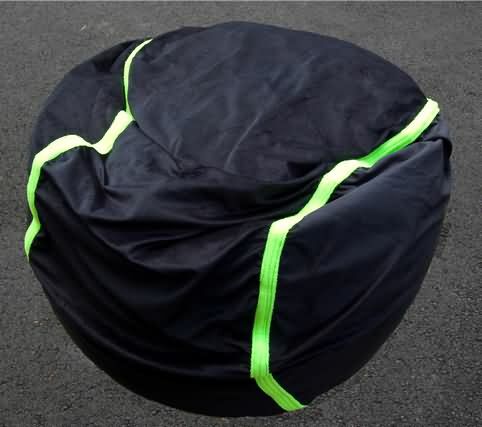 But what do I tell me seamstresses in terms of how to make our normal bean bag look like a tennis ball? Luckily, our chairs are sewn like baseballs, which are almost sewn like tennis balls. Baseballs have a little more of a curve to the seam, but I and the customer thought it would look just fine. The thing that would turn a round chair into a tennis ball is accentuating the seam. I describe the seam as being comprised of 2 snowmen that are cupped together. That probably doesn't make a whole lot of sense unless you look at a tennis ball or a baseball. My first suggestion was to use ribbon, about an inch or so wide. So the customer trekked to her local fabric store to find an purchase ribbon. I got a call from her, there wasn't any ribbon that would work - the colors were not quite what she wanted. But, she asked, could we somehow make fleece work? Confident in my seamstresses, I said we could make it work, as long as the fleece was anti-pill so she could wash the covers without the fleece getting pesky and unsightly little fur balls. When you wash fleece that isn't anti-pill, it eventually starts to look old - like a pill-y sweater. My seamstress cut the fleece into strips about 3 inches wide, doubled the strip on itself, and sewed them to make what I call fleece ribbons. I think she had to make 4 ribbons, 2 yards long so it would be long enough to cover the entire length of the seam. The ribbons ended up being about 1.5 inches wide, maybe a little less. I thought the zipper would be a problem, but luckily my skilled seamstress was able to sew the ribbons on without it interfering with the zipper (you need to be able to unzip the cover to wash it!). She sewed the ribbon centered on the seam of the bean bag cover, and kind of sewed it to the side of the zipper. These are the finished products. Pretty cool. Very soft. Totally washable. And quite unique! The customer ended up very pleased with the final products:"I'm impressed!! It looks great, we are super excited to receive them. Thanks for all your work on this :)"
Have you made or bought any bean bags in crazy shapes? I've seen fruit like strawberries, cherries, and apples. I've seen baseballs and basketballs. I've even seen one online that looked like a rock! If you want a tennis ball bean bag, let us know! We can do it in all sorts of color combinations, especially now that we know how to do it! Or, if you want to just get our chairs and sew the ribbon on yourself, it's definitely not that hard.